At the sound of his name, the black Labrador opened a sleepy eye and thumped his tail on the carpet. The quaint cottage nestled behind a white picket fence, surrounded by trimmed lawns, established shrubs and flower beds. Pink climbing roses, weaved their way around the rustic front door. “Oh, it's even better than the photos,” Jenny gushed. After unloading the car, as Dan went to park it in the small village car park, Jenny ventured out. The garden was bathed in soft, late afternoon sunshine. At the top, situated under a canopy of thick foliage, she saw a wooden bench, so took the opportunity to sit down for a moment to luxuriate in her surroundings, inhaling the flower scented air. It was idyllic, picture perfect and serene and she could already feel all her stress ebbing away. As Bruno sat at her feet panting, she gently stroked his silky ears. “This is the life, Bruno, time to chill out.” The dog looked up at her with his adoring eyes and big laughing face, as if agreeing with her. Jenny took the proffered menu. “So, where are you staying?” asked the Landlord. “I'll have the garlic chicken and, for the record, I don't believe in ghosts,” Dan retorted. “Haunted by what?” Jenny asked, her blue eyes round with shock. “We'll both have the garlic chicken and a bottle of your best red.” Dan ordered. Jenny woke the next morning to a ray of sunshine streaming through a chink in the curtains. She had slept well, aided no doubt by half a bottle of wine. Bruno stretched, yawned and padded over to to the bedside. She heaved herself out of bed, pulled on a silky dressing gown and went downstairs. After opening the kitchen door for Bruno, she filled the kettle at the sink under the window. Her eyes wandered over the pretty garden, to the bench at the top. She gasped... what on earth! The overflowing kettle, momentarily interrupted her concentration, and when she refocused her eyes, the image had disappeared. With shaking hands, she lifted two mugs from the cupboard and, as she dropped a tea bag in each, she heard Bruno barking outside. She went out to see him at the top of the garden, his body jerking as he barked ferociously at the bench. “Here boy,” she called, to no avail. She raced up to the distraught dog. “Hey, calm down, boy.” As she bent down to grab his collar, she noticed a single blood red rose in the centre of the bench. An icy shiver ran up her spine and she almost fainted at the sensation of a hand on her shoulder. “Jen, its me.” She looked up into Dan's worried, dark eyes. They turned to see the dog now digging furiously at the grass under the bench. “On the bench... I swear it was on the bench.” Jenny began to sob. “I'm not mad Dan, I saw it,” she stuttered. © Copyright 2019 Sue Harris. All rights reserved. 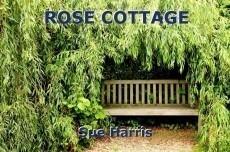 An intriguing story, Sue, and so well told. I enjoy paranormal mysteries like this. Thank you so much, Joe. Not my usual genre, but there was just something about that picture that inspired it. As always, I really appreciate your taking time to read and comment. It did sound too good to be true. A great explanation of why skeptic Dan never got to see anything. Brilliant story-telling, Sue. Thanks for reading, Hully, and for such a positive comment. As always, much appreciated. So pleased you enjoyed it. Thank you, jmm. So pleased you enjoyed it. Not my usual genre! Ooh, what a creepy, creepy story! Sounds like the prelude to a murder mystery... I like the twist of only Jenny and Bruno being able to sense the victim's presence, although I do pity them a bit- so much for a relaxing getaway! Thanks for reading, Kathryn. Not my usual genre... it was that bench! I do love a good ghost story. Thanks for reading, Markie. Much appreciated. I love the eeriness, Sue, excellent Flash, dear friend! Thank you, Lis. So pleased you enjoyed it, not my usual genre. Tsh! I couldn't so easily loose my appetite! xD There's always reason to be suspicious when things are priced cheaper then the norm. ;) Nice one! Thanks for reading, Stars. As always, much appreciated. The Haven Watch: The King's Throne?